This entry was posted in assassin's creed, sartor book and tagged featured on February 24, 2012 by gala5931. The lead writer for Assassin’s Creed sent me an email about The Sartor Classics! Just had a look at your incredible anthology – amazing work! We’re all quite humbled by the dedication and intelligence of fans like you, but not in the least bit surprised. AC games, for their mature and serious treatment of history, have always attracted fans with scholarly temperaments. And I think your project represents the apotheosis of this trend. Well done! The selection of books that ultimately made it into ACR came about through a joint effort by me and a number of other people on the team. I began with a smaller list of books that I felt was necessary, then crowd-sourced from our team to find the rest. And since we had people from six of the seven continents working on ACR, it wasn’t difficult to find rare classics that a Western educated wonk like me was sure to miss. This entry was posted in assassin's creed, sartor book on February 7, 2012 by gala5931. Part of a series of posts about the my Sartor Classics project. See all the posts here. Hey, it looks like M. Durand of Ubisoft did indeed receive the book! Wow, I just came back from vacations and received a very nice and strange gift! Had I ordered that? I could not remember of it, nor could I find any trace of it in my accounts. Livingston; who is this guy? Of course, searching for untold answers is my daily work and I was glad I could find an answer that easily. Eh! Seriously, thank you so much; this is a crazy fan-made gift! I’ll definitely have a deaper look into it and let everyone on the team know about it! And congratulations on making it up to the credits. Hope you enjoyed the game. This entry was posted in assassin's creed, sartor book on February 1, 2012 by gala5931. This is last part of a series of posts about the my Sartor Classics project. See all the posts here. After some Luluing, I had in my hands the final tome. All that remained was to send it to Ubisoft — but to whom? Of the hundreds of people employed by the company, who would be most likely to get a kick out of the project? Who picked these texts anyway? Apparently there is someone whose job is “Historian and Research”. This certainly sounds like the person I’m looking for. After a few phone calls and an ill-timed UPS shipment around the holidays, the package arrived at Ubisoft Montreal in early January. Did it make it to Maxime Durand? Did anyone there even open it? If so, did they dig it? My intent was to have this book arrive on someone’s desk unbidden, and with little to no explanation as to what it was, a puzzle based in the AC universe presented to those responsible for its creation in a way that would make them curious. So, it comes as no surprise that there is no word as of yet. If I do hear anything, though, I’ll be sure to let you know. Either way, it was a fun project. It certainly stands as my most involved fan project to date, and if collecting old texts, writing codes, and formatting books is your idea of a good time, I recommend it! This entry was posted in assassin's creed, sartor book on January 18, 2012 by gala5931. 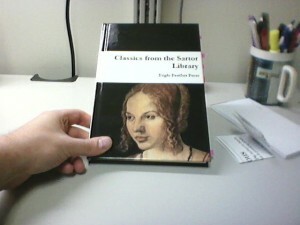 This is part of a series of posts about the my Sartor Classics project. See all the posts here. I do love me a story within a story, and that’s what I tried to create here. Alberti’s bit is only part of the larger whole. The first level is the book itself. Any AC fan will recognize the Durer portrait of Sartor on the cover, the initial indication that there’s something afoot within. A glance at the table of contents reveals the familiar list of books. So, it’s a collection of books from the game. Sure sure. But the foreword talks about Sofia and Ezio, and gives a brief history of the library itself. Ok, so there’s something new here. The foreword contains the words ‘Caesar’, ‘shift’ , ‘cipher’, and ‘three’, as well as having many letters underlined. In the version I sent to Ubisoft, I highlighted the words and made a margin note to key them on to the fact that there’s a puzzle here. The hidden message in the foreword reveals that the book is distributed by the Order to new assassins, and that the main text holds encoded text in the Alberti Cipher. Level 2 of the story. As the reader decrypts the message, a preface reveals itself. An assassin librarian in plague-year London decides to hide a story within Ezio’s and Sofia’s books before he dies. Level 3. The original books have survived, carefully preserved by the Order. And at last Alberti’s tale, a brief biography highlighting his experience with the Assassins. This entry was posted in assassin's creed, sartor book and tagged assassin's creed, Sartor book on January 17, 2012 by gala5931. Now, the goal was to send the final product to the Ubisoft studio in Montreal and raise an eyebrow. I wanted to make them curious, to draw them in. Thus, I needed to keep things relatively transparent; while my original intent was to make finding the existence of the hidden message a challenge in and of itself, the likelihood of someone receiving the book and taking enough interest in the thing to notice any subtle clues — well, it seemed a little self-important on my part. Hiding a text within a text consists mainly of signifying something unusual within the base content. A slight different font, formatting — there are several methods. In the interest of clarity, I simply underlined the letters I needed. And the trouble began. Seems easy enough, right? Take the ciphertext, find the matching letters in the base text, and underline. Easy. Except when the ciphertext has a “q”, and the base text doesn’t have one for five pages. I found myself running out of space, and that right quick. The best solution I could find was to just add the letters in, typos in the manuscript. The odd “z” instead of “s”. That sort of thing. Not ideal, but functional. This entry was posted in assassin's creed, sartor book on January 13, 2012 by gala5931. So, what to write about? Well, first I wanted to see what the state of encryption was in Ezio’s time. This led me to Leon Battista Alberti, who invented what we would call the secret decoder ring. And he was an architect. In Florence. In the late 1400’s. Who designed the facade of one of the buildings in the game, and is mentioned in the game’s database. And is a known humanist. In short, this was the guy. I penned a short story about this fellow and his connection with the Assassins. It had to be pretty short, since hiding it in the text would require some serious finagling. To encrypt the dang thing, I ended up writing an Alberti Cipher script to eat the text and spit it back out in code. Couldn’t find anything online that would do it. So, I had a collection of texts and a secret message to hid therein. Now for the fun part. This entry was posted in assassin's creed, sartor book on January 11, 2012 by gala5931. 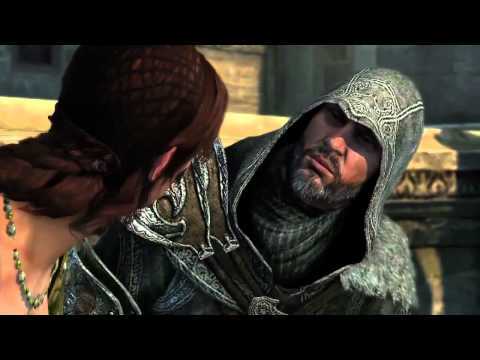 In Revelations, old man Ezio falls for a book vendor named Sofia Sartor. Secrets necessary to the completion of his mission are hidden in books throughout the game world, books which Miss Sartor states are out of print and would be lost to human history without your aid. That’s right. A game which asks you to rescue old books. I think you can imagine my reaction. Lady, you can count me in. As the collection grew, it became clear that the library would end up being a nice collection of classics from various countries. The Iliad and Odyssey. The Aeneid. Canterbury Tales. The Arabian Nights. The Nibelungenlied. And then a few pieces I had never heard of came about. The Hanging Poems. Heimskringla. Man, I should read this stuff. Enter Gutenberg.org and other such sites. Soon ye olde iPad’s bookshelf was replete with these texts. You know what’d be cool? If Ubisoft printed a collection of these. 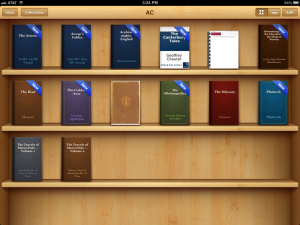 Like the Harvard Classics or the Loeb. …with some kind of assassiny secret hidden in it. Now, I had recently watched some crazytown fan movies. So much time and money spent on these labors of love. So why not try it myself? This entry was posted in sartor book, Uncategorized on January 9, 2012 by gala5931. With the yuletide upon us I find myself in the company of old friends, many of whom I do not see with any regularity. We exchange embraces and handshakes, express affection, and swap tales of our years. The Question comes more often this time of year: What are you working on these days? Well, it’s a little difficult to explain. Here’s a tiered attempt, in increasing complexity. …and then sent to somebody at Ubisoft, the game’s developer. Get all that? Good. Over the next few posts, I’ll be chronicling the making of my magnum fan opus. This entry was posted in assassin's creed, sartor book on January 6, 2012 by gala5931.